Home › Uncategorized › Kogan Creek power station debacle continues. Kogan Creek power station debacle continues. The eight year long Kogan Creek power station saga has come to a head as a solar liquidation by a French company leaves an Australian civil engineering firm $1.6m out of pocket. We wrote about the failure of the Kogan Creek Solar Boost program back in 2017 where it was labelled a $45m disaster. According to the Brisbane Times, the project was lost with the liquidation of Areva Solar KCP, an Australian-registered company which is controlled by the French state-owned energy giant Framatome SAS (part of Electricite de France). The project was to provide 44MW of solar thermal in addition to the 750MW Kogan Creek Power Station (which represents the equivalent of 44GWh each year of operation). The Brisbane Times have an article which embeds a video showing the ‘solar panel graveyard’ – a real shame for everyone involved and a disgrace for those happy enough to leave Nortask holding the bag. This highlights the issues Australia has with allowing overseas companies to work on big tenders – there’s likely to be little recourse for Mr. Speziali which is extremely unfair. 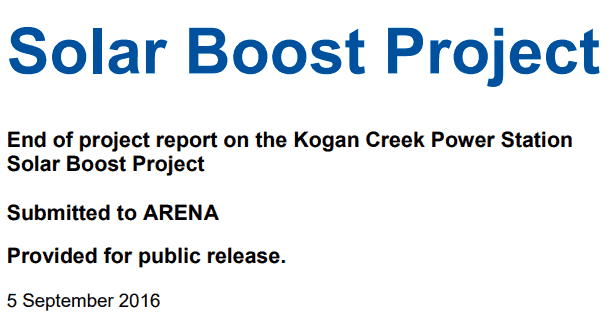 If you’re interested in reading more about the Solar Boost Project and how it turned into such a miserable failure, ARENA have an ‘End of project report on the Kogan Creek Power Station Solar Boost Project’ download available on their site, dated September 5, 2018. So it doesn’t have anything about the myriad issues which have continued since that date, but it has a lot of useful information on what not to do if you have $45m sitting around and want to build a solar farm. Click here or on the image below to download/read it. ← GAF Energy to sell residential solar.